We’ve all see those super cute muffin tin meals, right? Take a muffin tin and in each little spot, add a single component of a meal or snack – apples in the top left, then crackers, then cheese, then rolled up lunch meat – so on and so forth and until the muffin tins are filled. 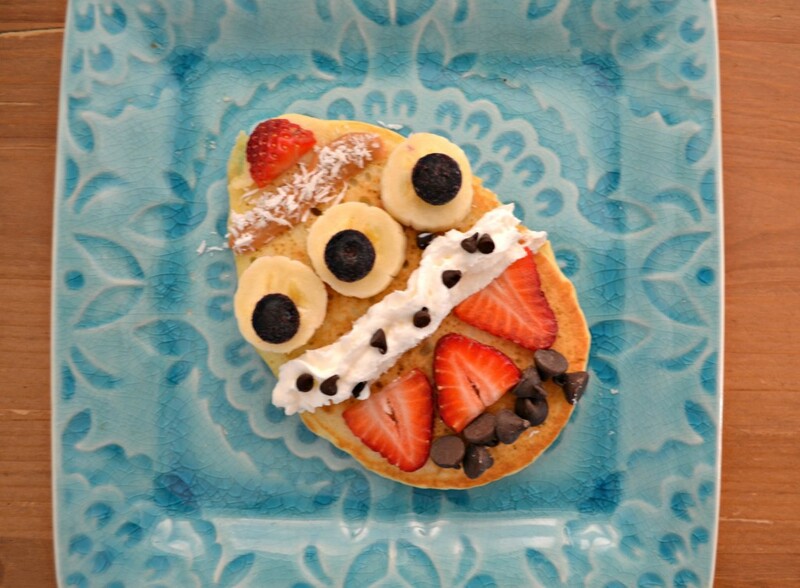 Place in front of your kiddo and voila – a fun way to get your kids to eat a whole meal. They add interest to an otherwise boring meal at home. 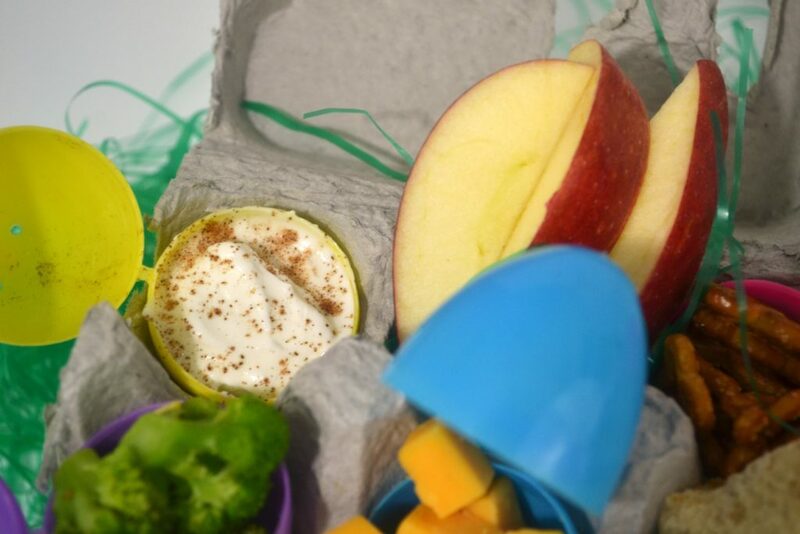 This fun Easter Egg Carton snack is the perfect way to incorporate the fun of the holiday and spring into snack or meal time. It’s such a simple solution to making a meal a little bit more festive and interesting – and if your kid is anything like mine, getting them to pay attention for more than 30 seconds is a gift in and of itself. I love making fun kid food for my boys, mostly for this reason alone. 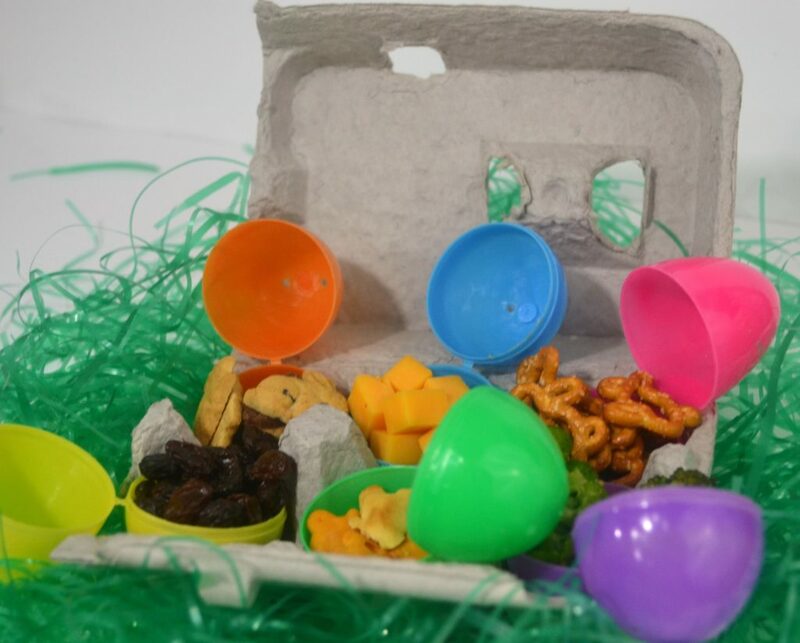 Grab an empty egg carton and line each hole with a plastic Easter egg. 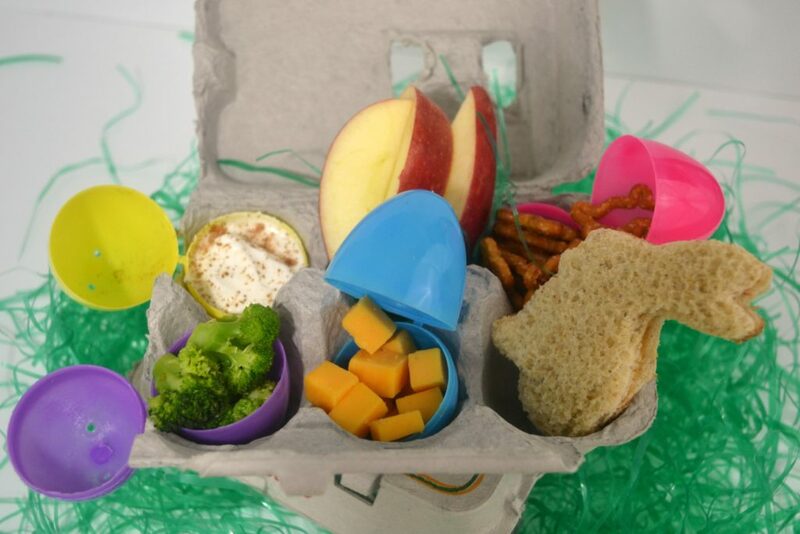 Fill each egg with treats, snacks, or components to a meal and watch your kid gobble it up. 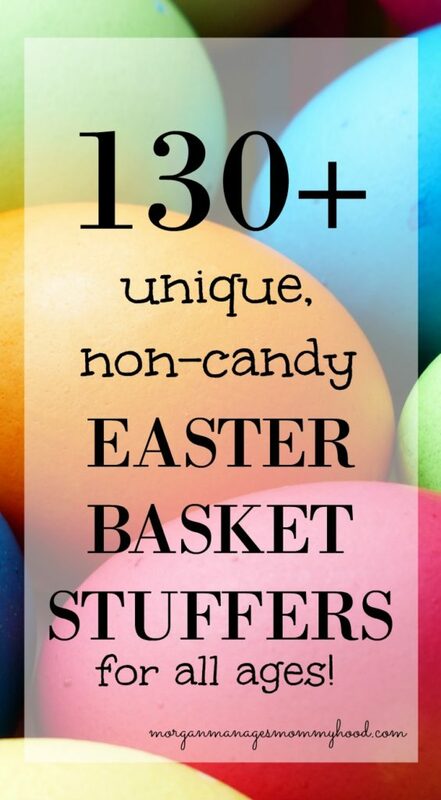 Keep it super festive by adding in Annie’s bunnies to a few of them. I used the graham bunnies in one, and separated the crackers and pretzels from the snack mix into the other two. They’re a favorite snack around here, so it was a win for sure. 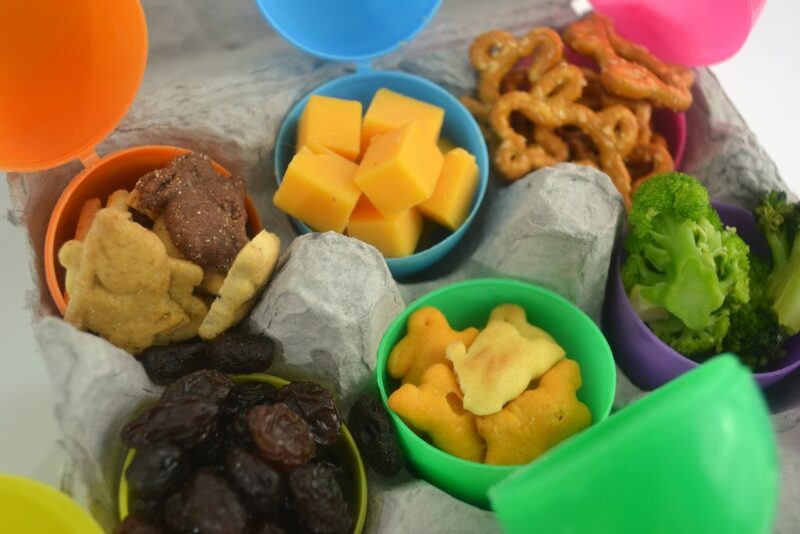 I think my favorite part about snacks like this is how versatile they are – it doesn’t have to match up or make sense, since everything is in its own little pocket. You can even transform it into a meal by adding a sandwich, deli meat, or a bigger carton. Seriously, you can obviously fill these with whatever you’d like, but if you want them to be mobile, you’ll want to keep your items smaller. I fit about 1 or 2 tablespoons into each egg. 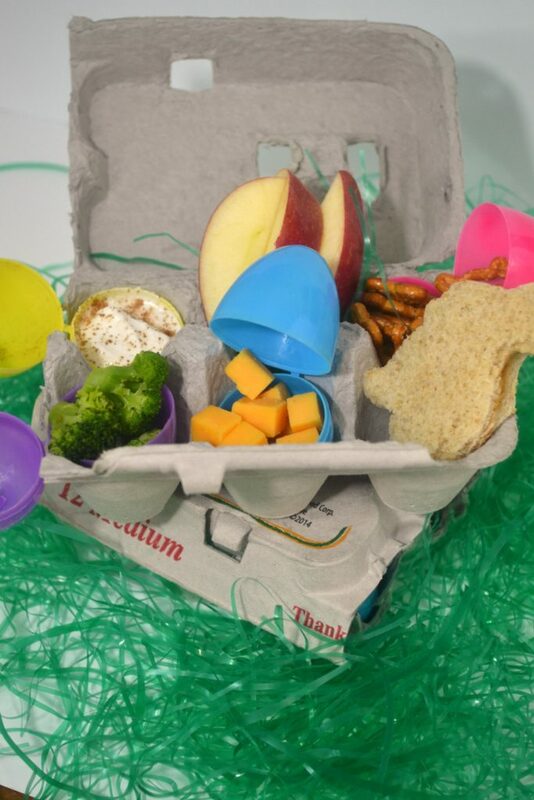 That way you can close the eggs, shut the egg carton, and travel. For bigger items (like the sandwich or the apple slices) I stuffed some of that plastic grass stuff in the egg carton hole and placed the item on top. 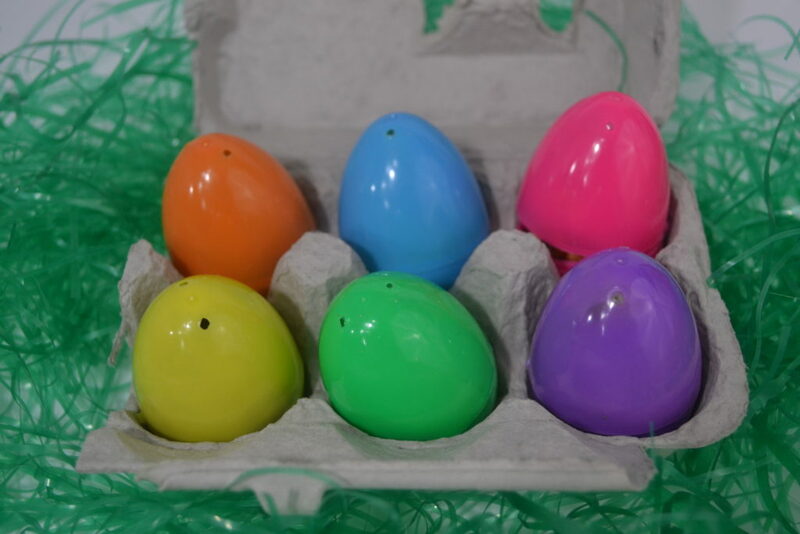 I used an egg carton for medium sized eggs and plain old plastic Easter eggs, the cheapest ones I could find. Those seemed to work perfectly together. While you can use a normal egg carton from your local grocery store, (I cut mine in half) I did see clean, plain egg cartons at the Dollar Spot in Target. *I used plain ol’ Greek yogurt since that’s what I give Ry to dip his fruit in. 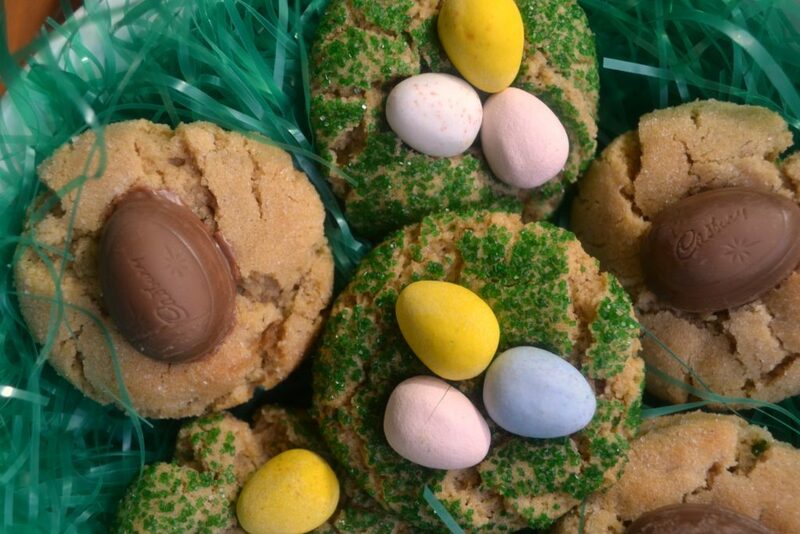 If your eggs have little holes in the bottom, you’ll need to plug them. Either line it with plastic wrap (especially if you want to re-use the eggs) or put something over the hole like peanut butter or a tiny piece of cheese smooshed in. 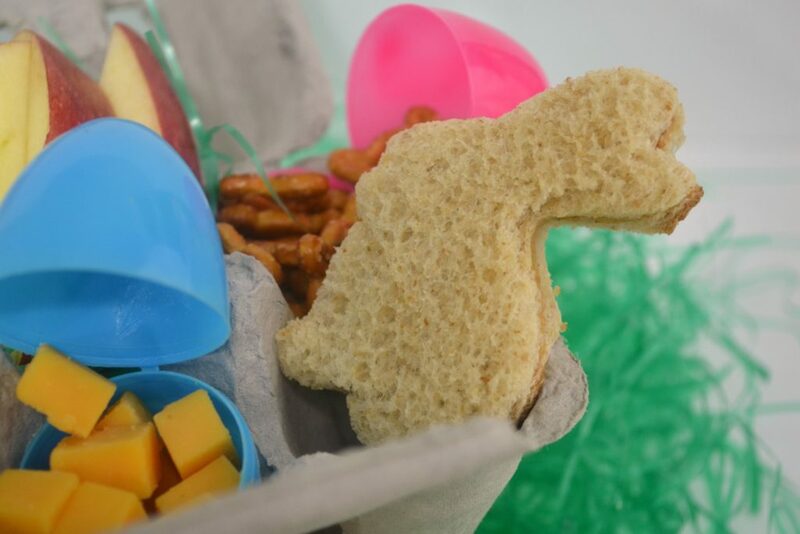 * Make it more fun by using a cookie cutter to make little sandwiches. Ryan will literally eat any sandwich if I cut it with a cookie cutter, so it’s a solid choice. So tell me – what would you put into your eggs?